Hunters coach Michael Marum has named Watson Boas to the Hunters side to play the Tweed Heads Seagulls on Tuesday despite being in doubt with a right shoulder injury. Souths Logan Magpies last Sunday where halfback Boas was injured in the second half. 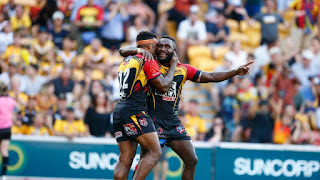 “We thought that Watson (Boas), who suffered from a right shoulder injury during the win over Magpies, would miss this weekend’s match but the injury was not as serious as we initially thought so we’ve included him in the side,” Hukula said. Boas will undergo further scans on his shoulder today before a decision is made before the team travel to Brisbane tomorrow. 14. Charlie Simon 15. Ila Alu 16. McKenzie Yei 17. Dilbert Isaac 18. Rhadley Brawa 19. Patrick Morea 20. Paul Wawa.